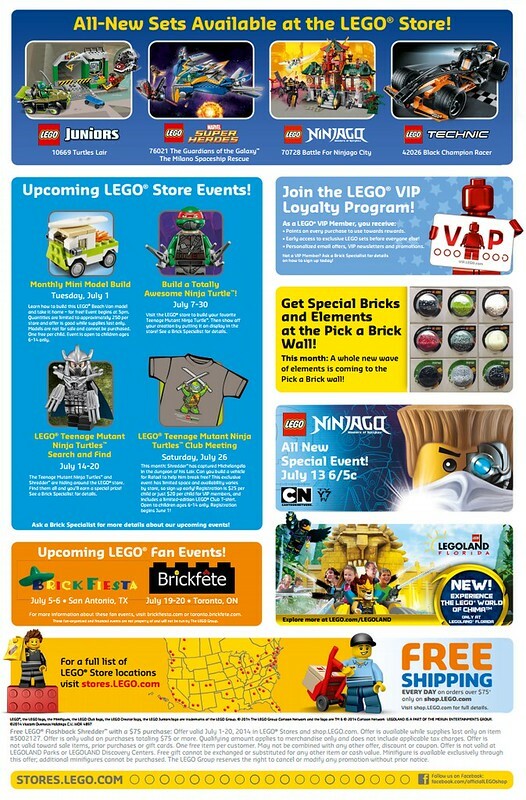 July is just around the corner and that means new promotions will be at LEGO Brand stores as well as on [email protected] . 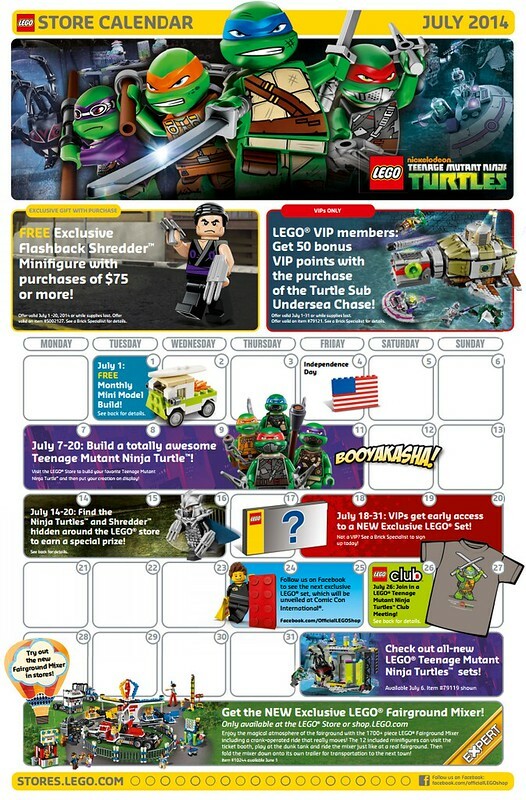 As we mentioned before, July will be a mostly LEGO Teenage Mutant Ninja Turtles themed month filled with events and giveaways to promote the line as well new Michael Bay movie that will be released in August. 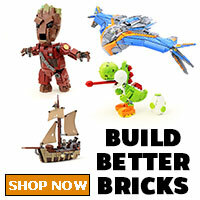 First is the Free exclusive Flashback Shredder Minifigure (5002127) with purchases of $75 or more. This minifigure will be offered from July 1-20 or while supplies last. The Flashback Shredder is just Oroku Saki in a Foot Clan outfit with his signature claws. For LEGO VIP members during the month of July, you will be able to get a bonus 50 VIP points for purchasing the Turtle Sub Undersea Chase (79121) . On July 1, the Free Monthly Mini Model is a cool little Old School Surf Van (40100). 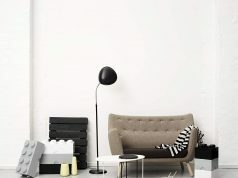 Families will be lining up early for a chance to build one and take home so get there early because I suspect that this month’s build will be a very popular one. 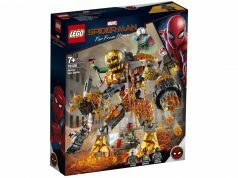 On the calendar, it shows an image of the Mutation Chamber Unleashed (79119) set and stating that new LEGO Teenage Mutant Ninja Turtles sets will be available on July 6. These wave of sets have been available for a while now and I believe they are actually referring to the Ninja Turtles movie sets being released since they have already started to show up at Toys R Us stores. From July 7-20, show off your building skills to create a Ninja Turtle and putting it up for display. From July 14-20, head over to your local LEGO Store to find the hidden Ninja Turtles and Shredder placed throughout the store. There is an unspecified prize for finding them all. 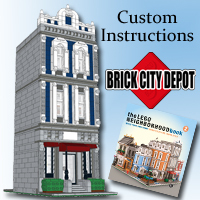 July 26 will be the LEGO Club Meeting and the t-shirt for July features Leonardo. From July 18-31, VIP members will get special early access to the new LEGO Creator MINI Cooper MK VII (10242). 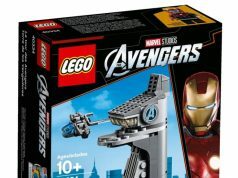 During San Diego Comic Con 2014 on July 24-25, LEGO will be revealing a new exclusive set which I suspect will be the highly rumored UCS Tumbler (76023). Everything is still under wraps at the moment but we will be on the show floor during those days to cover the event so stay tuned! It’s a new quarter so that means there will be some changes to the Pick-A-Brick wall. 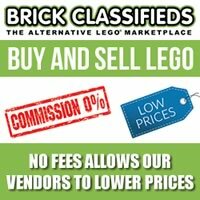 I’ve been informed that my store already has the new bricks in stock so I’ll be there during the Mini Build event to check out the wall as well. 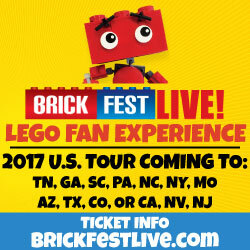 Some upcoming LEGO events include Brick Fiesta on July 5-6 and Brickfête on July 19-20. For those who are in the UK or other parts of Europe, you guys have a different set of promos for July.